I’ve been traveling and on vacation for about a month and am finally back in St. Louis. One the of the first things I was told after arriving back at the apartment: “There are 10-ish really overripe bananas in the fridge.” Sure enough, I crack open the fridge door to find the top shelf almost completely full of black, mushy bananas. Gross. It’s pretty obvious these bananas are past their prime and I have only one recourse: banana baked goods. We’re going to turn them into Banana Coconut Cake with Cream Cheese Frosting. P.S. Don’t worry about Bob, the Minion, sitting on top of the cake. He’s just claiming his territory, and isn’t he just the cutest? Everyone and their mother can make banana bread, but how many really delicious banana-y goods have your really had? I’m sure you’ve had your share of dry and tasteless “banana bread” that ends up being a mouthful of cinnamon, nutmeg, and allspice. Or even the antipode of overly damp and sticky mush. Neither is good and frankly, I’m appalled that these imposters make up the bulk of the world’s experience with banana baked goods. 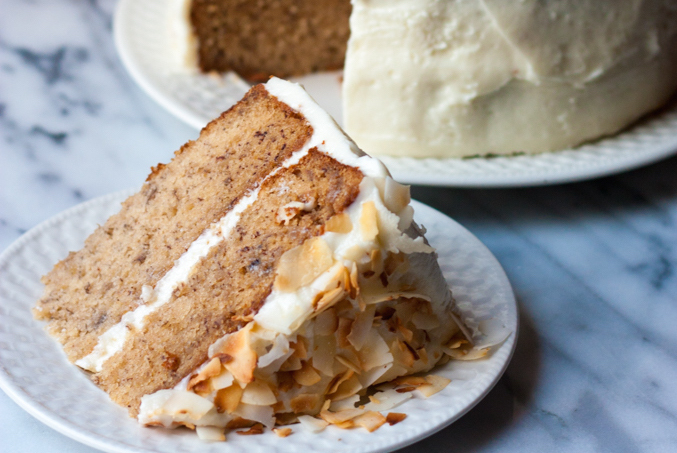 To create the ultimate Banana Coconut Cake with Cream Cheese Frosting, I consulted Christina Tosi of Milk Bar and America’s Test Kitchen. 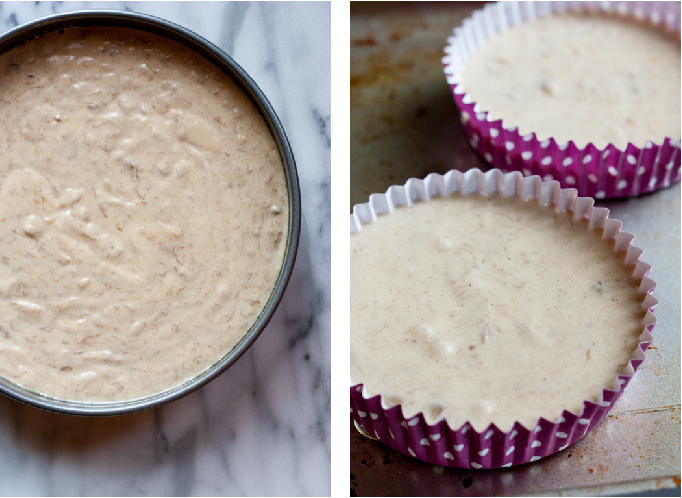 Both sources emphasize the need to use really overripe bananas. Like to the point where you want to just throw them away because they are inedible. When you use bananas for baking, you’re essentially use them for their high fructose content as a substitute for sugar. Of course, the riper the fruit, the more fructose it contains. That’s why you need to let those bananas go bad. Really bad. They will be mushy and unappealing (heh), but that’s what you’re looking for. As you can see in a picture above, the bananas I used were completely black on the outside. I won’t gross you out with what the bananas look like on the inside, but I’m sure you can use your imagination. 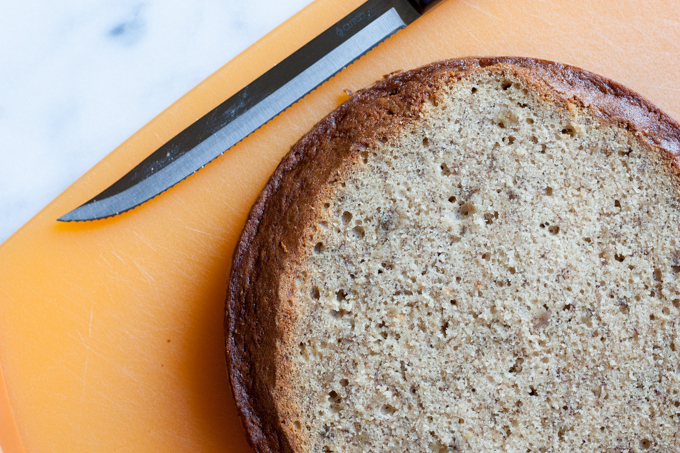 The other method of really harnessing the banana flavor comes from Cooks Illustrated’s Banana Bread recipe. While they also like to use black bananas, they added in a trick to eliminate excess moisture. Once you peel the bananas, microwave them for 3-5 minutes and then let them sit in a strainer above a saucepan. You’ll start to see the liquid pool in the saucepan. 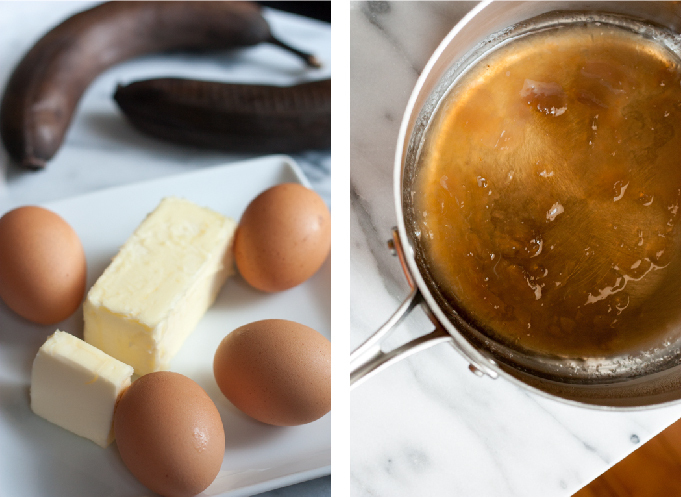 Don’t throw away the liquid in the pan, reduce it down until it and mix it back in with the mashed up bananas. This is the essential step that people miss. These sad little bananas that we forgot about for three weeks in the fridge will give our Banana Coconut Cake with Cream Cheese Frosting the most flavor without compromising the texture or the structural integrity of the cake. I used two 9-inch round pans and was left over with a little bit of extra batter. I could have fit it all in the pan, but I was slightly nervous it would overflow in the oven. It would have been fine, but this way I got a little snack during the process! This recipe is interesting because the baking method is low and slow. Instead of the standard 325 degrees, the cake goes in a 275 degree oven for about an hour. The cake bakes evenly, but if it does dome up in the center, just shave off the top with a sharp knife to level it out. I know this might seem like an unnecessary step that wastes cake, but you really don’t want your cake layers slipping all over the place. Plus, the crunchy top of the cake is the perfect utensil to clean the frosting bowl and paddle. The banana cake was a little sweeter than I expected, even after I cut down on the sugar. I didn’t factor in the sweetness from the bananas, so just keep that in mind! If your bananas are not ripe enough, you might want to add some more sugar, but if yours are black and mushy like mine were, you can probably dial it down. 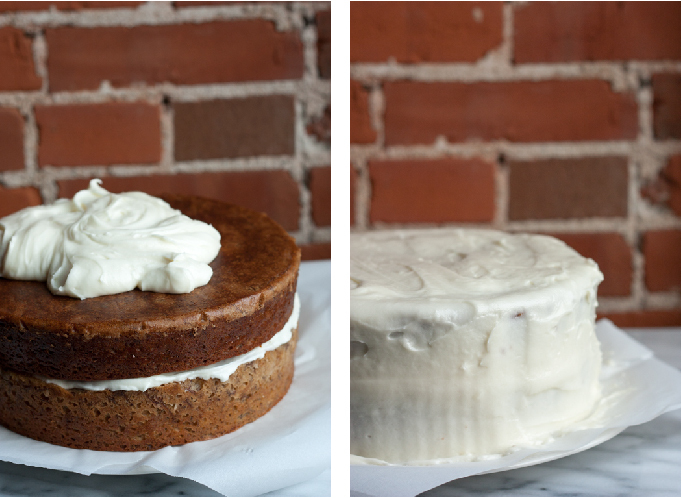 Of course, this banana cake needs the tanginess of a cream cheese frosting. Just your basic cream cheese, butter, powdered sugar, and vanilla. Since the cake is on the sweeter side, I also added a pinch of salt to help balance the flavor. If you don’t sift your confectioners sugar (because you don’t like cleaning the sifter or breathing in sugar) you might get lumpy frosting. Don’t fret, just turn the mixer up on high and let the paddle beat out all the lumps. A minute or two should do it. Don’t forget to use that slice of cake we leveled off to scrape down the sides of the frosting bowl. Whoever you bestow the task of cleaning the bowl will be forever grateful. I usually like to freeze my cake layers before stacking and frosting, but I was running a little behind schedule. As long as your cake isn’t warm or steaming, it is fine to start frosting. The extra step of freezing it after you dirty ice it is really just a precaution so you don’t pull up visible crumbs in the top layer. I was feeling lucky so I just went for it. Thankfully, the cake dieties were looking upon me favorably that day and it turned out alright. 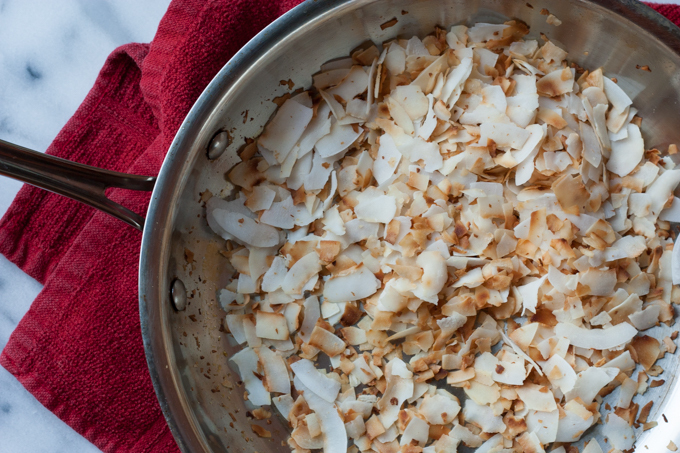 To top the cake with a crunchy and colorful component, I toasted some coconut flakes until they were fragrant and golden brown. Be careful when toasting the flakes as they can go from perfectly golden to burnt in a second. The pan can hold on to a lot of heat, even when you take it off the stove. Walnuts would also be a lovely complement to the cake if you so choose. (My friend Lyn once managed to burn 3 trays of walnuts for a salad. Eventually, the nut toasting became a group effort.) Once the flakes or nuts cool, they are ready to top your cake! 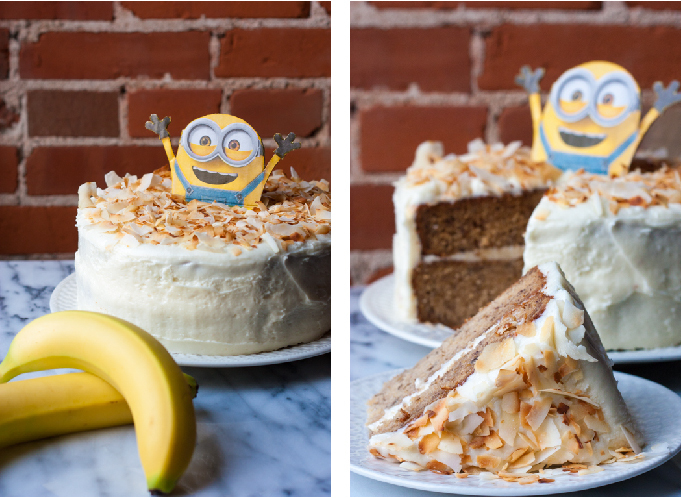 And what better way to top a Banana Coconut Cake with Cream Cheese Frosting cake than with a banana crazed lunatic? Bob here was also waiting for me when I got home, in the form of a yellow Minion Amazon box. He was too cute to throw away, so I cut him out and made him a cake topper. It’s very fitting. 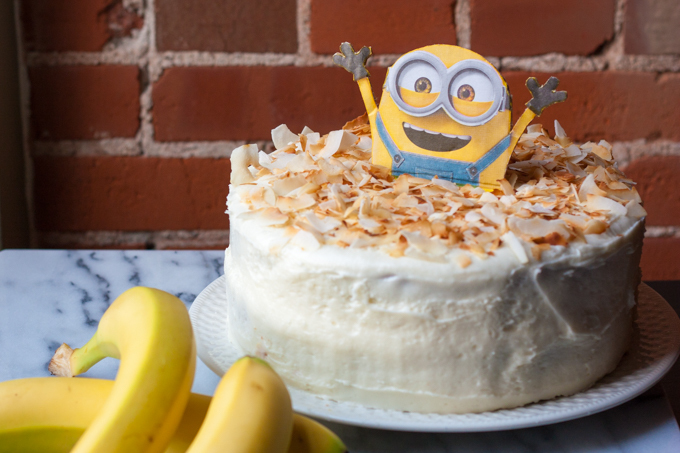 I’d like to think that Kevin, Bob and Stuart would love a slice of this cake while laying on a tropical island, enjoying their summer vacation from evildoing and eating as many bananas as they desire. If you are unfamiliar with these lovable yellow henchmen and my last paragraph made no sense, educate yourself and experience the phenomena of the minions. This Banana Coconut Cake with Cream Cheese Frosting is light and fluffy, but bursting with banana flavor. 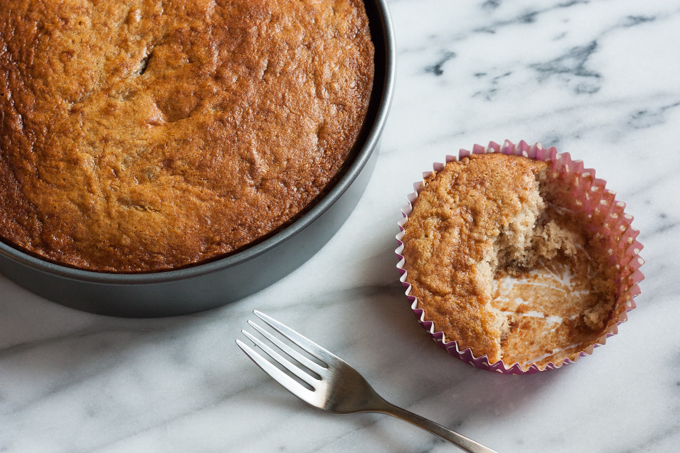 Even those who didn’t expect to like a banana cake found themselves pleasantly surprised! I don’t want to oversell this humble cake as I think my steadfast banana hater, Lyn, still wouldn’t touch this cake. So go ahead and keep those really overripe bananas. 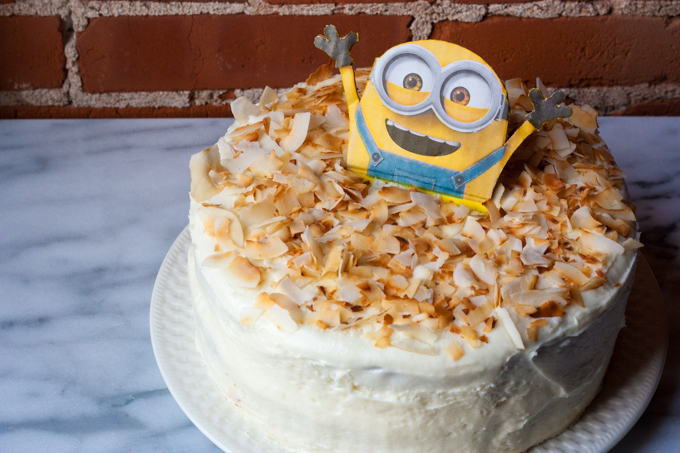 Build up a stockpile in the fridge or freezer and bake this cake for the minions and humans in your life! Never waste bananas again! Bob approves. Peel bananas and microwave them for 3-5 minutes. Transfer bananas to a strainer sitting over a saucepan. Let bananas sit for an hour in the strainer, until liquid starts to drain out. Reduce the liquid until thick. Take the saucepan off the heat and mash the bananas with the reduced liquid. Preheat oven to 275 degrees F. Grease and flour two 9 inch rounds. In a medium bowl, mix flour, baking soda, cinnamon, and salt; set aside. 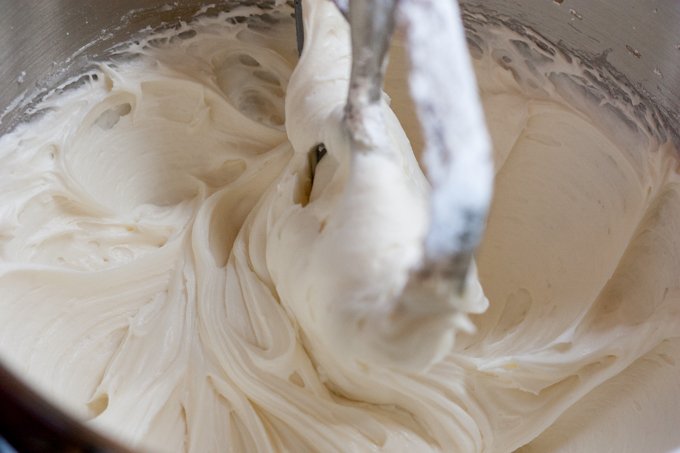 In a large bowl or your stand mixer, cream butter and sugar until light and fluffy. Beat in eggs, one at a time, then stir in vanilla. Pour batter into prepared pan and bake in preheated oven for one hour or until toothpick inserted in center comes out clean. Place on a cooling rack. Sprinkle toasted coconut over top of the frosting, if desired.